I got excited when I saw a legendary turning, but then after a second disappointed because it was Nat, the Darkfisher. Why should anybody use this card? I can not think of anything except maybe a fatigue deck. But even for such a deck, I don't see Nat as a good choice. Why does this card exist? Are there any synergies with anything? The best use you can do of Nat is in a Mill deck (example). With this kind of decks your win condition is to make the opponents burn through their whole deck, bouncing their minions back in hand and eventually killing them through fatigue damage. In these decks Nat the Darkfisher is very good since it gets a good body (better than its 2-mana cost) with an effect that, while being problematic in other decks, helps you progress your win condition. Going along with walrus helmet's comment and Mathias711's answer, one possible use of Nat is as a counterplay against the heavy control/combo decks such as wallet warrior, freeze/giants mage, and fatigue druid. These decks revolve around controlling the board, outlasting the opponent and letting fatigue damage kill, instead of actually dealing damage to face with minions. (Freeze/giants finishes you off with burn spells or many many giants.) In these decks, every single card counts, so any milled cards will most likely hurt the opponent's game plan significantly. Thus, Nat would be used to surprise the opponent into drawing 2 cards and milling when the opponent is on 9 cards in hand. However, he is significantly difficult to keep alive and effective, as he is such a small minion and the opponent can either play around Nat, keeping 8 cards in hand, or just remove him with the good removal tools that those decks run. Thus, Nat will probably not last over too many turns and will need to have an immediate effect to be useful. Therefore, he is fairly well used in a mill deck, where he represents the opportunity of an additional milled card, but even so, he is not very effective, as the mill opportunity is 50-50. Alternatively, and perhaps more effectively, he can also be used as a win condition in the fatigue game in a fatigue deck, since he can be used to force the opponent to draw fatigue cards and take the resulting damages. The opponent will be highly compelled to use removal on him instead of your other threats, since he represents a far larger source of damage than normal minions. A deck idea that uses Nat is a Reno fatigue warrior, since Reno control decks usually run into fatigue and run a large variety of cards to keep Reno active at all times. 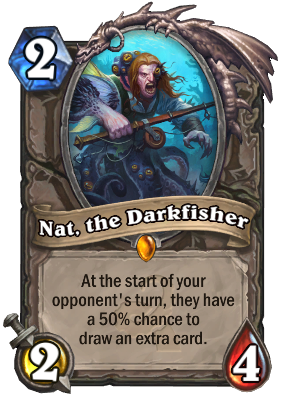 Nat would fit well into this archetype because he can be used to force the opponent to draw at any time, especially in the fatigue game, during which most of the opponent's removal will have been used up. If you are playing a deck that if always ending in fatigue, this may be a good option, because your opponent needs to draw more cards, so take more fatigue damage. All other answers mention Fatigue or Mill decks. This is, perhaps, the obvious use for Nat. Another interesting use case, completely different from the above, is in a Paladin aggressive deck. 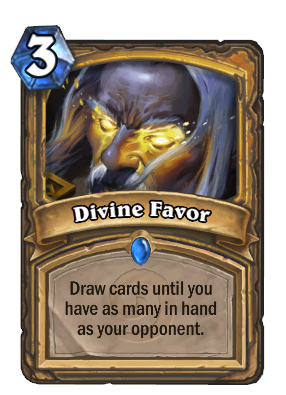 The idea is that you make your opponent draw more cards, and then you play your Divine Favor for greater value. I played against a Nat/mill deck last night that caused me a few problems. To get some use out of C'Thun, I was having to play more mana expensive cards. My opponent forced me to continually draw cards, which meant that my hand filled up and I saw C'Thun and some of my other key cards get auto-discarded. By the time I had the mana to start using my cards, half my deck was gone and any strategy I had was in tatters. How can I get gold versions of cards in Hearthstone? What is the main weakness of a zoolock-deck? Why would one player get the Fireside Friends achievement and not the other? How can I use Card Order? Should I craft golden copies of the cards going to the Hall of Fame? Why was this minion summoned?